Utagawa Kokunimasa (Ryûa) (1874–1944). Our Soldiers' Great Victory at Pyongyang, 1894. Oban triptych. Click here for a full-size image of the right-hand panel. The great change that was ushered in by the Meiji Revolution in 1864 found its first international expression in the Sino-Japanese war of 1894. It was here that the two or three decades of foreign investment and cultural harrowing finally found fruition. Look at the image of the Japanese men in this print… it is almost impossible to identify race or country from the uniforms, the gestures or even the facial features. These are the uniforms of the British or the Prussian army, these are the weapons of the British army… the officer in the right-hand sheet raises a British army dress sword not a Japanese sword, even though the edge, the heft and the balance were far superior. Everything has become modelled on the west, the flag on the flagpole, the horses' bridles and saddles, the men’s insignia, their hats, their rifles, even their gestures. Note also how despised is the enemy and how in this and in all these senso-e prints, great emphasis is placed upon the ‘primitive’ attributes of the Chinese. The Chinese are depicted with pig-tails and antiquated weaponry, their gestures are crude and clumsy, their expressions always ones of primitive horror or rage. As if to be other than western is to be shameful and despised. By 1894, the Japanese have simply disposed of their culture. There is literally no trace. In fifty years, centuries of unchanged civilisation have been eradicated… replaced with a borrowed British/American fancy dress. The print celebrates the Japanese victory at Pyongyang in 1894. 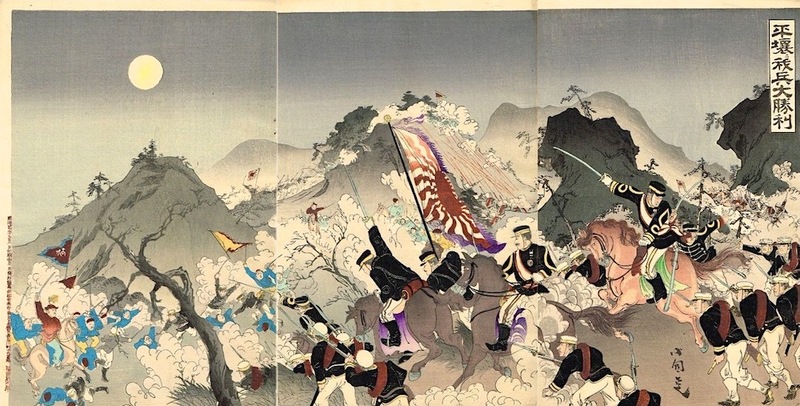 It was the second major land battle of the First Sino-Japanese War and took place on 15 September in Pyongyang, Korea between the forces of Meiji Japan and Qing China. The Japanese Army converged on Pyongyang and made a direct attack on the corners of the walled city . The Chinese defence was strong, but was eventually overcome by the Japanese from the rear. The survivors of the Chinese garrison escaped although Chinese casualties are estimated at 2,000 killed, and around 4,000 wounded. The Japanese lost 102 men, with 433 wounded and 33 missing. 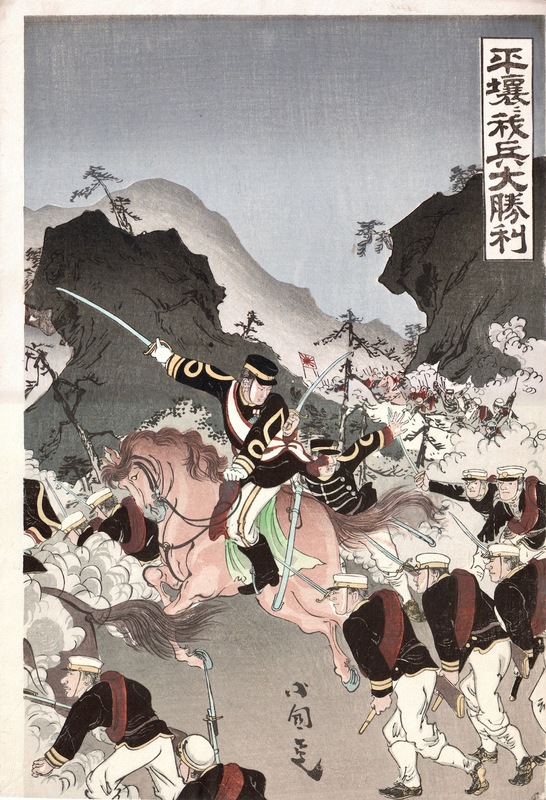 There are many prints that commemorate the victory and it is hugely important in embedding the idea of Japan’s modern army in the minds of the nation. The print, despite perhaps the subject matter, is simply outstanding. These prints are really the last great flowering of the Japanese art of the woodblock and are unjustly overlooked sometimes. The quality of the printing, the shading and the composition are peerless; indeed, sometimes whilst holding these prints it is almost impossible to imagine that they are not watercolour paintings, rather than made from the resisting medium of wood. Very fine colour, condition and impression, exceptional bokashi and gauffrage. Full-size sheets with margins throughout. Embossing to cartouche.